There’s been lots of talk about our transition from an industrial manufacturing economy to a digital economy. Many people have been caught in this transition, just as many young farmers were caught in the transition to the industrial era and ended up filling the slums of rapidly growing cities more than a hundred years ago. While we see low earnings growth in cities and suburbs, this has been especially a problem in small towns and rural areas. With all the talk about the issue, there’s been very little action considering the size of the problem – particularly impactful programs to help these folks. And those that do exist usually deal with part of the one problem, say training but not placement or the other way around. That problem is in part due to silos that have been created by our laws. Nevertheless, there are some programs worth watching, expanding and emulating. Digital Works, a non-profit organization which currently operates in Kentucky, Michigan, Mississippi, New Mexico, Ohio and Texas is a good example. This is not about creating more computer programming and other high-level jobs in big cities. Nor does it work on helping low-income people in areas with concentrations of traditional metropolitan city corporate employment, such as the successful Workforce Opportunity Services. Instead, as you can tell from where they operate, Digital Works focuses on rural areas and small towns with high unemployment – the part of the economy that has been most left behind. As an example, one of their locations is Gallipolis, Ohio, about forty miles from the West Virginia border in southeastern Ohio. At its high point in 1960, almost 8,800 people lived there. The Census Bureau estimates there are fewer than 3,500 people there now. These are also the places that require residents to travel the most to get to big (or even bigger) cities that have concentrated traditional employment in factories, offices and stores. So being able to make a living, by working digitally, in or near your home opens up all kinds of new economic opportunities. Digital Works trains local people for contact center work that can be done anywhere there is sufficient Internet connectivity, either at home or at a work center. The goal is that the work pays better than minimum wage, with performance-based raises and promotional opportunities. Digital Works handles the whole cycle that is necessary for the unemployed – recruitment, screening, training, placement, mentoring, development and retention. (It reminds me a bit of the transitional work programs for urban poor and ex-convicts that I helped run much earlier in my career.) They even work with their graduates to obtain the National Retail Foundation’s Customer Service Certification. They will create remote work centers in partnership with local governments in those areas where broadband is not yet widely available. It’s worth noting that Digital Works is a subsidiary of Connected Nation, which itself is focused on increasing broadband deployment and adoption. Digital Works is fulfilling the vision of the Internet as the foundation for expanded economic growth everywhere it can reach. And, of course, to complete the circle, a large part of their effort is on developing relationships with companies that would pay the people to whom they are giving several weeks of training. These business relationships also ensure that the training provided is what employers are actually looking for – something that is often discussed in other training programs, but not so closely practiced as by Digital Works. 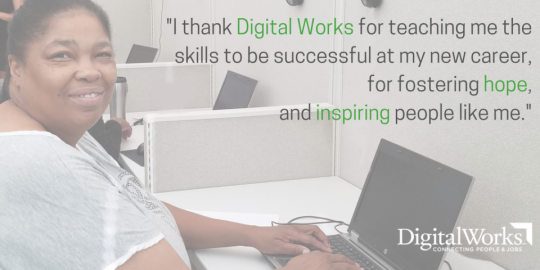 Digital Works’ data shows that the program has an 85% graduation rate and that 91% of their placements retain employment for more than a year.